We're making improvements to the way shared calendars in Office 365 sync across your applications. This article is intended for IT admins, to help them understand the changes that are rolling out. The improvements are planned only for calendars shared between people using Exchange Online. There are no changes to shared calendars when one person's calendar is hosted in Exchange on-premises. Consistent permission options when sharing a calendar. See Share a calendar. An easy ﻿way to ﻿accept a shared calendar invitation. See Accept a shared calendar. Shared calendars that sync to all devices with changes that appear right away. See S﻿ync and edit shared calendars. These improvements roll out over the next year. This article focuses on the changes you can see today and provides details about future plans. For a quick snapshot of schedules, see Timeline of calendar improvements across clients later in this article. Sharing your calendar in Outlook on the web for business or Outlook.com. Sharing your calendar in Outlook on iOS or Android. Sharing your calendar ﻿in Outlook on PC. The first improvement is that users can share their calendar ﻿from any version of Outlook and have the same permission options on all versions. The table below shows the current state of the work to make it easier to share calendars. Available starting in Version 1805. Available starting in Version 16.23.326.1. Sharing a calendar is enabled only for Windows 10 on PC and won't be released for Windows 10 Mobile. The second improvement is that users can easily accept shared calendar invitations from any Outlook application, and see those shared calendars on all their devices. The table below shows the current state of the work to make it easier to accept a shared calendar invitation. Av﻿ailable starting in Version 1805. ﻿This isn't enabled yet for all Windows 10 Mobile users. The third improvement is that users can view all their shared calendars on any device or calendar application. If someone changes a shared calendar, all other people sharing the calendar will see the changes instantly. Users will also notice performance improvements when viewing and editing shared calendars. Using a shared calendar will be as fast and reliable as managing the user's own calendar. When a user shares their calendar with people today, they will see the improved shared calendar experience after accepting the invitation. However, if they shared their calendar with people before these changes were enabled, they won't see these improvements automatically. To upgrade existing shared calendars to the new shared calendar experience, ask users to follow the instructions in Upgrade an existing shared calendar to the new model later in this article. After users upgrade to the new model, shared calendars will sync to their mobile phones. In the future, existing shared calendars will be upgraded automatically, but there's no schedule yet for this automatic upgrade process. With instant syncing enabled, a shared calendar reflects changes made by others immediately. Currently, not all types of shared calendars support instant syncing. The following sections cover the types of shared calendars and calendar applications that support instant syncing. Instant syncing is enabled only if both users are in the same Office 365 tenant, or if the calendar is shared by an Outlook.com user. The table below provides more details about the types of configurations that support instant syncing. In the future, instant syncing will be enabled for all calendars shared among Office 365 and Outlook.com users. Currently, instant syncing occurs only if the calendar is directly shared with the recipient. If the recipient has permissions via the default organization user, the recipient will not receive instant sync updates. We are currently working to change this. For these recipients, syncing happens approximately every three hours. Syncing happens approximately every three hours. If external sharing isn't allowed for the calendar owner's tenant, it's treated like the calendar is being shared to a third-party user. This configuration currently generates an Internet Calendar Subscription (ICS) URL. The shared calendar recipient adds the shared calendar using the ICS URL, and the sync timing is determined by the recipient's calendar service. For example, if the recipient is in Outlook.com, the calendar will update approximately every three hours. If the recipient is in Gmail.com, the calendar might be updated every 24-48 hours. This configuration currently generates an ICS URL. The recipient adds the shared calendar using the ICS URL, and the sync timing is determined by the recipient's calendar service. The table below provides more details about the applications that support instant syncing. Not yet available; see Notes. Instant syncing expected to roll out in 2019 for Office 365 users on the Monthly update channel. Note: Exchange Web Services (EWS) API will not support instant syncing. To use instant syncing, the shared calendar must be enabled for instant syncing, and the calendar application must be updated. If ﻿the shared calendar is enabled for instant syncing, and the user is viewing it on Outlook on the web, Outlook for iOS, or Outlook for Android, the new sync experience is in use. If the user views the shared calendar on Outlook for Mac, they'll see the new sync experience if the calendar was added by accepting a sharing invitation. However, if the user added the shared calendar via File > Open another user's folderor if the user added the account as a delegate account, they'll be on the old sync experience. 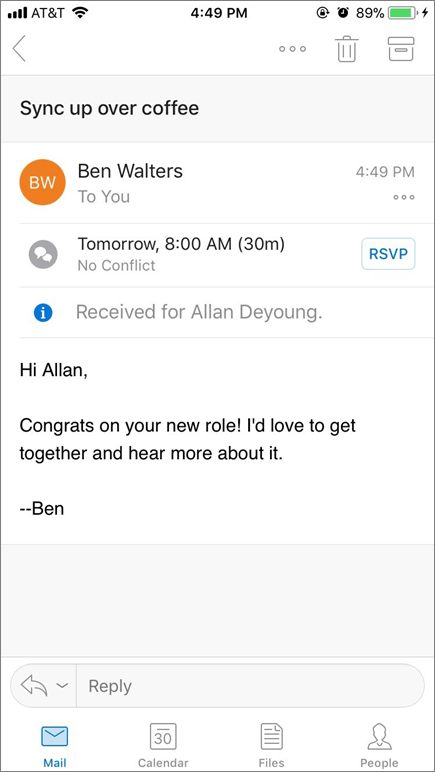 Changes might appear faster in Outlook on the web, Outlook for iOS, and Outlook for Android. If the user views the shared calendar on Outlook for PC, they'll see the old sync experience regardless of how the calendar was added. Currently, for the same shared calendar, changes might appear faster in Outlook on the web, Outlook for iOS, Outlook for Android, and Outlook for Mac than on Outlook for PC. This section describes how these improvements were accomplished, and what changed in the architecture of shared calendars in Office 365. The improvements are only applicable for calendars shared between users in Exchange Online. There are no changes to shared calendars when one of the users is hosted in Exchange on-premises. An entry (similar to a hyperlink) is stored in the recipient's mailbox. The entry points to the owner's mailbox but doesn't store any calendar data in the recipient's mailbox. A new calendar is created in the recipient's mailbox, and this calendar contains a copy of the owner's calendar (starting one year prior to date of acceptance). Reads and writes directly from the owner's mailbox. Reads and writes from the local copy of the shared calendar stored in the recipient's own mailbox. The application periodically polls the owner's mailbox for changes and syncs them. The service instantly syncs changes to the recipient's local copy. This triggers a push notification to the application which syncs the changes instantly. For more details, see Functionality differences in new model shared calendars later in this article. Users who accept a new shared calendar invitation from an updated version of Outlook automatically start using the new model of calendar sharing. The easiest way for a user to check if they have the improvements (meaning the new model of calendar sharing) is to check if the shared calendar appears on their mobile phone. If it does, the shared calendar is already upgraded to the new model. A local folder for the shared calendar appears in the Calendar subtree. An entry exists in the Common Views > Associated Contents table. The entry’s named property name is SharingCalendarGroupEntryAssociatedLocalFolderId, and it will point to the ID of the local shared calendar folder. Ask the calendar owner to re-share the calendar with them. The user can do this from any Outlook application, including Outlook for iOS or Outlook for Android. The user should then accept the shared calendar invitation using an updated version of Outlook. It's important that the user accepts the invitation from an updated version of Outlook. If the user accepts the invitation using an older version of Outlook, the shared calendar will not be enabled with these improvements. Existing shared calendars don't need to be removed before re-accepting. Open the calendar from Outlook for iOS or Outlook for Android. This option does not require the owner to re-share the calendar. The user simply needs to use Outlook for iOS or Outlook for Android to add the shared calendar, and the calendar will be upgraded automatically. The option to add a shared calendar is available under the calendar module: Click on the profile picture in the upper left to view the list of calendars, click the + icon in the upper left, and select Add Shared Calendars. Note: Opening a shared calendar by searching the directory for the calendar owner will add the calendar via the old model of sharing. In the future, shared calendars will be upgraded to the new model regardless of which method the user chooses. There is no timeline for this yet, however. This section discusses where and when instant syncing occurs in the current state of our work. The following table shows the types of syncing that exist for shared calendars in the new model. Changes sync instantly. This applies to calendars shared between users in the same Office 365 tenant, or shared from an Outlook.com user. Shared from an Outlook.com user to an Outlook.com or Office 365 user. Shared directly between Office 365 users in the same tenant. Changes sync periodically (within three hours in most cases). Recipients won’t see changes on a shared calendar immediately, but the copy will be updated every few hours. ﻿Shared indirectly between Office 365 users in the same tenant (via default user permissions, or via a security group with more than 100 members). Shared between Office 365 users in different tenants, with external sharing enabled. An Internet Calendar Subscription (ICS) URL is generated when the calendar is shared. The recipient can use this URL to add the shared calendar to any calendar service that they use. With ICS URLs, the recipient’s calendar service chooses when to sync the calendar to receive new updates. If the recipient is an Outlook.com user, the sync will happen approximately every three hours. Shared between Office 365 users in different tenants, with external sharing disabled. Shared from an Office 365 user to an Outlook.com user. Shared from an Office 365 or an Outlook.com user to someone using a third-party calendar service, such as Gmail. Direct permissions: The calendar owner shared directly to the recipient, and the recipient is listed individually in the calendar owner's permissions list. Group permissions: The calendar owner shared the calendar to a security group, of which the recipient is a member. Default permissions: The calendar owner set a default permission for users in the same organization, and the recipient has access via the default permission. Currently, instant syncing is only enabled for direct permissions and for group permissions if the group size is under 100. In the future, instant syncing will be enabled for all three permission types. Additionally, if the user has shared to more than 500 recipients (a person or a group each count as one recipient), instant syncing will not be enabled. Office 365 to another Office 365 user (if external sharing is enabled). A full shared calendar is created, but the sync will happen approximately every three hours. Instant syncing will eventually be enabled for this setup. Office 365 to an Outlook.com user. If external sharing is disabled, sharing to another Office 365 user also falls into this group. An ICS URL is generated when sharing, which the recipient can use to add to any calendar service. With an ICS subscription, the recipient’s calendar service chooses when to sync the ICS subscription to receive new updates. If the recipient is an Outlook.com or an Office 365 user, the sync will happen approximately every three hours. Sharing with a user on an external service such as Gmail is a different kind of calendar sharing. In these scenarios, an Internet Calendar Subscription (ICS) URL is generated that links to the owner’s calendar. Recipients can use this URL to view the calendar in a web browser, or add it to their own calendar service by adding an internet calendar using the ICS URL. With ICS subscriptions, the recipient’s calendar service chooses when to sync the ICS subscription to receive new updates. If the recipient is an Outlook.com user, the sync will happen approximately every three hours. If the recipient is using another calendar service, such as Gmail.com, the sync might not happen as frequently. Shared calendars that use the new model differ from the old model in several areas of functionality, including reminders, permissions, delegated meetings, and third-party clients. In the first phase of calendar sharing improvements, recipients will always see “Reminder=None” for shared calendar items, regardless of the true reminder value for an item. If a recipient with edit access tries to change the reminder on an shared calendar item, the new reminder value will be locally saved only for the recipient and not for the owner. Reminders in the old model: In the old model of sharing, the recipient accessed the calendar owner’s mailbox directly. Therefore, when a recipient viewed a calendar item, they saw the same reminder value that the owner saw. Outlook clients knew how to detect which calendars were shared calendars, so they did not show pop-up reminders for any shared calendar items. Behavior change in the new model: In the new model of sharing, the shared calendar is stored locally in the recipient’s mailbox. Therefore, when mobile applications sync these shared calendars, they might not always check whether it’s a shared calendar. In those cases, we found that when the true reminder value was synced to a recipient who was using a third-party EAS or REST client, the recipient was flooded with reminders for other people's meetings. We're investigating ways to improve the reminders experience without breaking third-party clients. The following table provides is examples of how reminders differ in the old and new models of shared calendars. In the past, there was no consistent set of permission-level options across Outlook clients. As part of these improvements, updated Outlook clients will show a simplified and consistent set of sharing permission levels. If the owner uses Outlook on the web, Outlook for iOS, Outlook for Android, or Outlook for Mac to change permissions, the recipient’s copy of the calendar is immediately re-synced to the new permission level. If the owner uses another application to change the permissions, the calendar will be re-synced sometime in the next few hours, but it will not happen immediately. If the recipient is in the same organization, and the calendar owner has the My Organization (default) user set to any permission other than None, the recipient’s calendar will be updated to reflect the default user’s permission level. The shared calendar will remain on the new model, but it might have a different permission level. If the recipient is in the same organization, and the calendar owner is not sharing their calendar to the My Organization (default) user, the shared calendar will be removed from the recipient’s mailbox. The recipient will no longer see the shared calendar in their calendar list. If the recipient is in a different organization, the shared calendar stops syncing but is not removed. Delegates have always been able to view delegated meeting messages from their mobile phone because the invitations are received in their inbox. However, in the past, delegates did not have any indication whether the meeting invitation was for them or for whoever they're a delegate for. 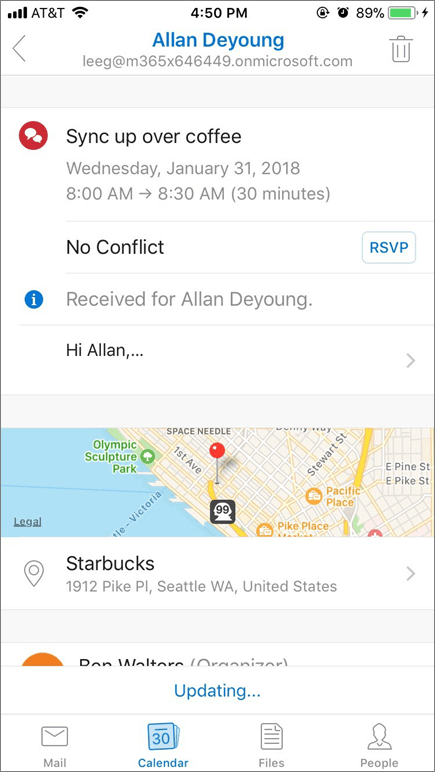 To better support this scenario, Outlook for iOS and Outlook for Android have added UI to make it clear for whom the meeting invitation is intended. For example, note "Received for Allan Deyong" in the following screenshots, which indicates that the invitation and the mail are for Allan, not for the delegate. The new model of calendar sharing differs in third-party mail clients in a few scenarios, which are described below. In EAS clients, recipients with read-only permissions will see the option to create a meeting or respond to a meeting on that read-only calendar. Doing so will save locally to the client's cache, but the changes are rejected by the server. The recipient's changes will not be reflected in the owner's calendar because they don't have edit permissions. This issue occurs because EAS clients don't differentiate between read-only versus read-write permissions on shared calendars, and treat all calendars as editable. Some third-party clients have client-side logic to always add the current user as an attendee of meetings. Therefore, if the user is using the native calendar apps on their phone and viewing a meeting on someone else’s calendar, they might see their name in the attendee list. This only occurs if they’re viewing the calendar on third-party calendar applications – when they view the same meeting on Outlook for iOS or Outlook for Android, they won't see their name on the attendee list. We don't support the shared calendar improvements for EWS-based clients, so improvements aren't available in any calendar application that uses EWS, such as Mac OS X. Outlook for Mac currently uses EWS and shows legacy shared calendars that don't have these improvements. The Calendar app in Mac OS X uses EWS and shows legacy shared calendars that don't have these improvements. I don’t want my users’ calendars to sync to mobile phones. What settings can I use to disable this? We don’t have any plans to allow the shared calendar improvements to be disabled for tenants. My users are concerned about data usage when shared calendars sync to their mobile phones. What should I tell them? If you clear the shared calendar option in the calendar list, Outlook for iOS, Outlook for Android, and Windows 10 Mobile will not sync the calendars that aren't selected. Most mobile calendar applications should also follow this behavior. Does this also apply to resource calendars? Any calendar that can be shared is eligible for these improvements. If a user shares their calendar, a shared mailbox calendar, or a resource mailbox calendar, and the recipient accepts using Outlook on the web, Outlook for iOS, or Outlook for Android, they will start seeing these improvements. However, for resource mailboxes in particular, there are some inconsistencies with the way that permissions show in the Outlook permissions list compared to the Admin center’s permissions list. We're working to make the permissions show consistently. However, the shared calendar functionality works as detailed above for resource mailbox calendars, and the recipient will be able to see the resource calendar on their mobile phone. Do you now support sharing a calendar to Office 365 groups? Not yet, but it’s high on our list. You can currently only share calendars with individual users or with security groups. Will these changes make it easier for a single person to have multiple calendar delegates? These improvements, especially the faster syncing, will make it easier for multiple people to manage the same calendar, but the multi-delegate scenario is not a goal of these initial improvements. For the best experience, only one delegate should manage the shared calendar. Below is the summary of the current state of the calendar improvements. Timelines listed below are subject to change. *Applies only to customers who purchased Microsoft Office on a monthly or yearly subscription basis. **Available starting in Version 1805. ***Available starting in Version 16.23.326.1.